The principle behind metal crystals is relatively simple: the metals found in most everyday objects were formed by pouring molten metal into an appropriate mold and then rapidly cooling the assembly. This means that the atoms that comprise the liquid metal do not have a lot of time to diffuse through the material and find a location that minimizes their electrical potential relative to the other atoms—they might have time to trade places with their neighbors and form small, ordered regions within the metal structure, but overall the metal solidifies before each atom has had time to try out every possible position in the structure and find the one with the least repulsion from the other charged particles. This means that most metal objects lack global order—under a microscope, small crystalline patches will be visible, but overall the structure is a hodgepodge of various crystal structures and orientations. This rudimentary explanation suggests that cooling a molten metal slowly will allow larger crystals to form, which provides the logic behind Mr. Gary’s approach, in which molten bismuth is slowly cooled on a stovetop. 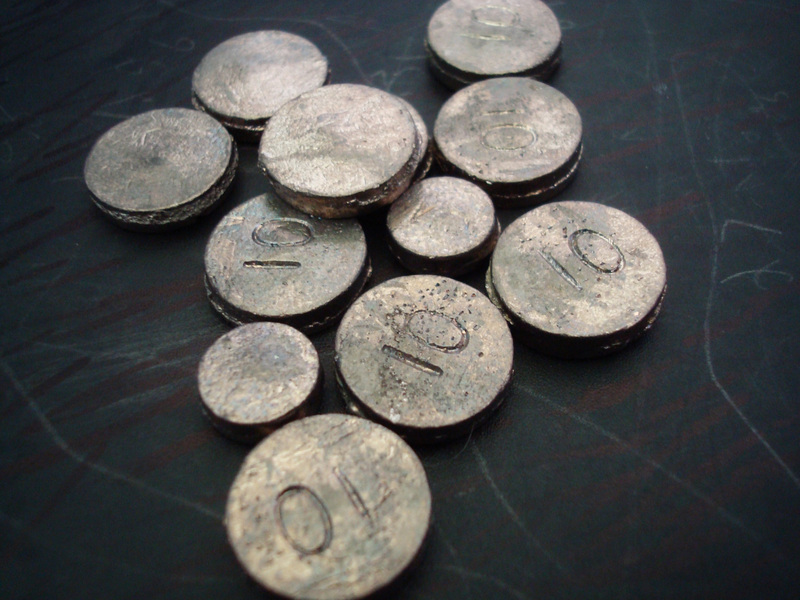 The idea of metal atoms rearranging themselves also suggests why blacksmiths anneal steel knives by raising them to high temperatures for long periods—at high temperatures, it becomes easier for bonds to break and atoms to trade places and find more energetically favorable positions in the material, thus making the knife more crystalline and thus rigid. 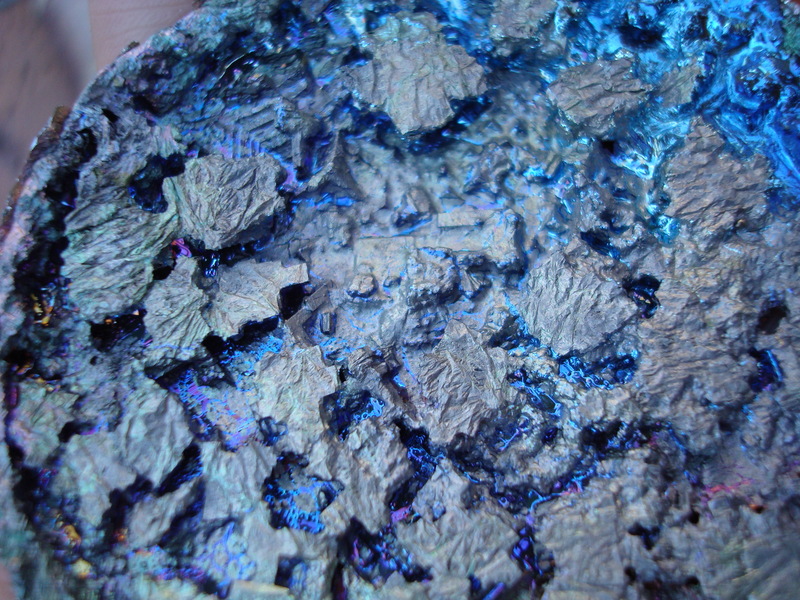 Colorful bismuth oxide patterns appear when bismuth is melted and re-cooled. 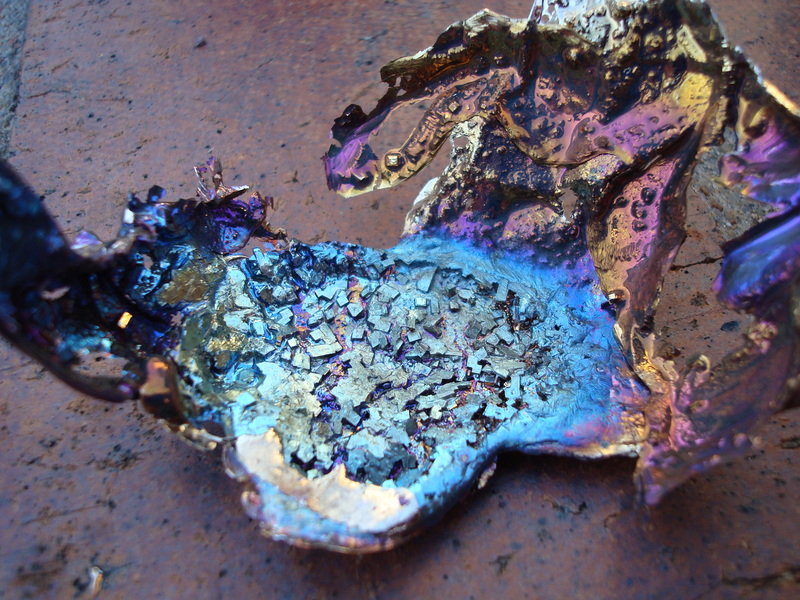 The remainder of the bismuth after the melting process. Above are some of my efforts to implement Mr. Gray’s approach. The setup is exactly as Mr. Gray and other sources describe–—the bismuth melts at a very low temperature, much like its noxious cousin, lead, and so a steel pot and butane flame are all that are needed to get started. 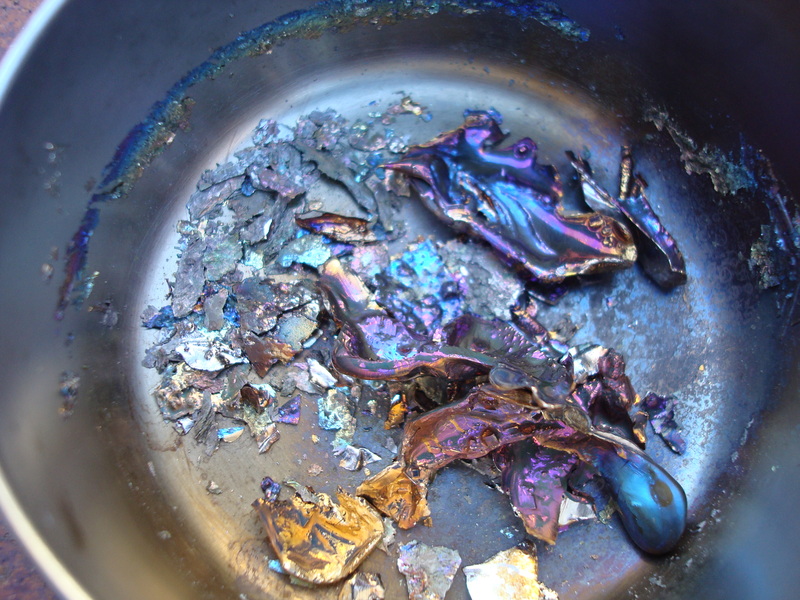 I checked to see how much of the bismuth had re-solidified by blowing on the surface—do not shake the pot, as this will disrupt the formation of larger cubic crystals. 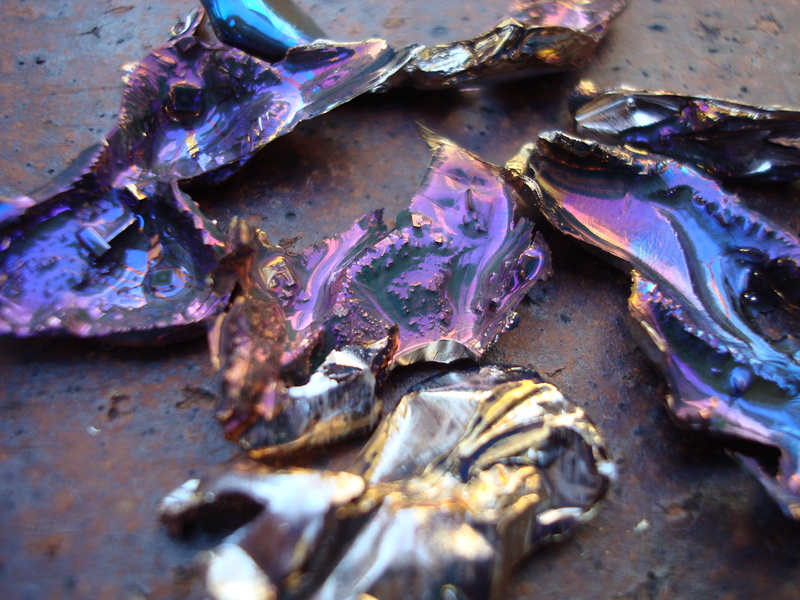 Once half or so of the pot has congealed, pour off the remaining liquid bismuth to reveal the crystal structures. Small pieces of elemental bismuth, purchased from a chemical supplier. Bismuth can also be found in certain types of game shot (it is often used in lieu of lead)—for more information, see what Scitoys uses bismuth for. Posted on 12/24/2011 by gammacephei. This entry was posted in Chemistry and tagged bismuth, bismuth oxide, crystals, metal crystals. Bookmark the permalink. Thanks for that. Bismuth is a such an amazing cusp of the biotic and abiotic. If only because some is there to appreciate its mystery. I often imagine a bit like the stairways from Moria and Mordor. Or where ever.